Having Car Problems? Do You Need Auto Repair? A car is critical to your everyday life; you completely rely on it and for good reason. Purchasing a vehicle is a big investment, one that requires a commitment to regular maintenance and repair. Understanding common car problems and the reasons behind them can help you evaluate the urgency of auto repair and know when it’s time to see a professional. 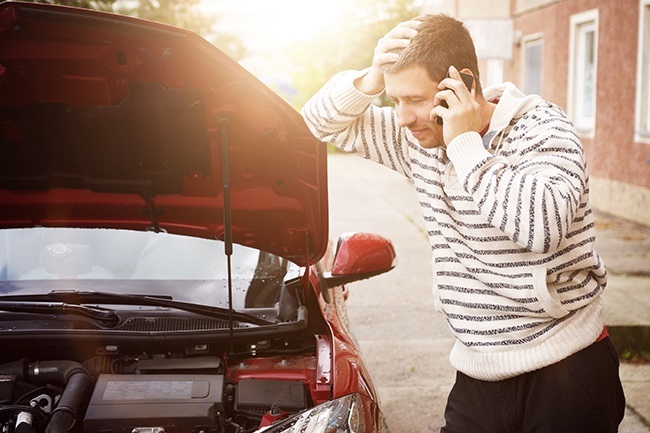 Explore the possible diagnoses below for more information on your car or truck problem. We’ll update this list frequently, so check back often! If your vehicle’s check engine light is on, there are a number of possible causes – including a loose or damaged gas cap, a malfunctioning oxygen sensor or mass air flow sensor, a problem with your catalytic converter, or failed spark plugs. While a check engine light does not warrant panic or immediate attention; you should have your car or truck checked out by a mechanic sooner rather than later. Often, these small components contribute to your vehicle’s performance. More importantly, any one of these component’s failure can cause other parts to fail as well. The simplest cause to this problem – because it’s the easiest to fix – is improper tire pressure. Under- or over-inflated tires can cause a car to pull (or a lean) while driving. Check the PSI of your tires and fill them if necessary to rule out this suspect. A punctured, damaged, or flat tire can also cause your vehicle to pull to the side. A few other possible culprits include improper wheel alignment, a worn down suspension, or brake problems. Pay attention to how and when your car pulls to the side. Is it pulling to the left or right; does it pull when you accelerate or brake? This information will help your mechanic diagnose and solve the problem faster. Smoke coming from your engine is definitely a cause for concern. First things first when diagnosing the issue; what color is the smoke? The most common reason for white smoke is an overheated engine; likely caused by a blown head gasket. If the white smoke doesn’t have a real smell and is paired with hissing, low coolant levels, a defective thermostat, poor airflow through the radiator, a collapsed radiator hose, or even a leak could also be to blame. If blue smoke is coming from under your hood, it’s likely caused by burning oil – either you’ve gone too long between oil changes or the oil level is too high. Black smoke that gives off a gas smell could be caused by bad spark plugs or ignition problems; as well as a number of other engine component failures. Squeaking from under your hood is often the sign of a serpentine belt problem; especially if the squeaking becomes worse or stops when you increase speed. Check your belts for visual damage and get service if you see or hear problems. If your vehicle does nothing when you try to start it, you likely have a battery, alternator (charging), or starter problem. The same is also likely your problem if your car will not start in the cold of winter. If the engine clicks but does not turn over, an electrical system error is usually to blame. Now, if the engine in your car or truck cranks but doesn’t start; an essential engine component may need to be repaired or replaced. In this instance, you’ll be going nowhere fast. In any case, if your vehicle won’t start, give Dave’s a call for a tow! We’ll be happy to take your car home or the shop for inspection, diagnosis, and repair. If you notice a very strong exhaust smell in your car, it can be caused by a leak in the exhaust system. There may be a hole in the exhaust pipe, tailpipe, or muffler which can also affect fuel efficiency. If you’ve lost power steering (turning the steering wheel suddenly becomes difficult), a broken belt is likely the cause. Low power steering fluid, a damaged or lose belt, pump failure, or a faulty steering rack can also be the reason. A steering wheel that shakes once you’ve accelerated to higher speeds is typically attributed to a damaged drivetrain or suspension problem. A drive train can become damaged by something minor like hitting a curb or major like an auto accident. The suspension of a vehicle is made up of several components, each playing an important role in the safety and proper operation of your car. If the shock absorbers, linkages, or springs fail, a shaking steering wheel may be the first sign of trouble. Spark plugs ignite the combustion in your engine and need to be tuned regularly. If the spark plugs have excessive build up or need to be replaced, the engine won’t run or start properly. Squealing or grinding when you brake is a tell-tale sign that you need new brake shoes or pads. The Squealing will grow louder the longer you wait to get brake service. A brake pedal is supposed to feel firm; you should not have to push it very hard to start slowing or stopping your vehicle. If you have a soft or spongy brake pedal, especially if you have to push it to the floor to stop, there is a problem and you need to see an auto repair shop for a brake inspection. In most cases, a damaged brake line or air in a brake line is the cause. Engine noise can often be an indicator that something is wrong with your motor – and always warrants a trip to the mechanic. Low oil levels and pressure, excessive valve lash, or worn or damaged parts are often to blame. The scent of mildew in your car may be caused by the growth of bacteria and mold in your air vents. Frequently running your AC in hot weather can produce condensation that creates opportunity for growth. If you need auto repair in Kenosha, visit Dave’s Muffler. Our local mechanics will get to the root of your car problems and provide a solution that gets you back on the road quickly without breaking the bank. Our honest prices and incredible customer service will ensure that you feel comfortable coming to us for any issue, big or small. Quality service and affordable prices all in one place, contact Dave’s Muffler today! Since 1989, we have been servicing the Kenosha area! Come in and see us, or contact us with any questions you may have, today!